At a Right2Change meeting in Dublin’s Mansion House, the former Greek finance minister Yanis Varoufakis accused the Irish government of pandering to oligarchs. Mr Varoufakis told the Right2Change meeting in the Mansion House thatMichael Noonanand Brendan Howlin were both part of a conspiracy to crush the Irish people. Former Greek Finance Minister Yanis Varoufakis has inhabited many guises. The “rock star economist”, “the bad boy of capitalism”, and even “Dr. Doom”—the latter referring to his rather gloomy worldview and tendency to predict economic Armageddon. An economics professor by trade, he was an unusual choice for the role of Finance Minister in the left-wing Syriza government, with his open-necked shirts, leather jacket and radical, anti-austerity views. The media might have been mesmerized by his stint in government at the height of the Greek debt crisis from January to July 2015, but his fellow Eurozone ministers, with whom he repeatedly clashed, were less enamoured. He was forced to resign before a new bailout could be agreed for his beleaguered nation. Now Varoufakis has a new role, as spokesman for a pro-democracy movement that launched on Tuesday in Berlin. Billed as a pan-European collective, DiEM25 (Democracy in Europe Movement 2025) aims to shift the balance of power away from the unelected Brussels bureaucrats and restore it to the people and their elected representatives. Without this Varoufakis says, in typical fashion, the European project is doomed. Newsweek sat down with him to discuss his political future, the forthcoming U.K referendum on its EU membership, and his longstanding friendship with Margaret Thatcher’s former chancellor, Norman Lamont. What is behind the launch of this new movement? Do you really see the European Union as a threat to democracy? Last February, while visiting the federal finance ministry in my capacity as Greece’s finance minister, an aide to Dr Schäuble asked me playfully, but not without a strong hint of underlying aggression: „When am I getting my money back? Does the federal government of Germany genuinely place above other priorities getting its taxpayers’ money back from Greece? Was the finance ministry aide, who asked me that question, genuine in his concern? In other words, can German citizens trust their government to prioritise recouping the money that Germany has lent the Greek state? Or does the German government have other, unstated, priorities? Let’s approach this question dispassionately. Greece’s economy is badly damaged. Whatever the reasons, Greeks have lost exactly one third of our national income (since 2010), Greek banks are unable to lend even to profitable firms, and investment from abroad has dried up. These are facts independently of your theory, dear reader, or mine, as to their causes. Why a pan-European democracy movement? The threat to democracy has always been the disdain the establishment has for it. Democracy by its nature is very fragile and the antipathy towards it by the establishment is always extremely pronounced, and the establishment has always sought to undo it. Why did you resign the very next day after the ‘no’ victory in the Greek referendum? Because the Prime Minister told me, on the night of that magnificent result, that it was time to surrender to the troika. Not what I had entered politics for and certainly not what the mandate that the 62% NO vote we had just received stipulated. To believe that the troika would honour the spirit and the letter of the 20th February Eurogroup agreement. It was on the basis of that false belief that I signed, a few days later, the application for an extension to the previous loan agreement. Some people blame you for the painful turn of the Greek situation during the first Syriza Government. Are you guilty? 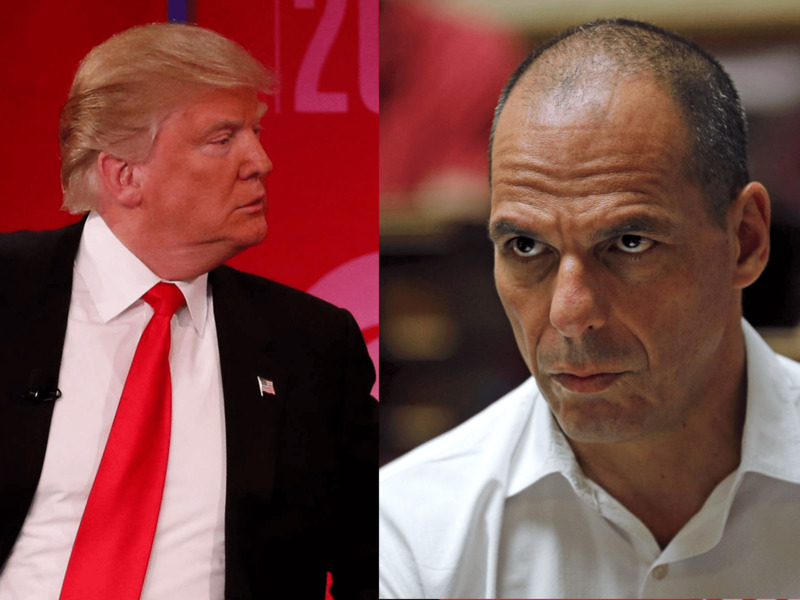 The year 2015 did not begin – or end – as Yanis Varoufakis might have predicted. This time last year, having finished a busy academic term at the University of Texas in Austinwhere he was a visiting professor in economics, he had flown to Australia for a holiday. Varoufakis has a teenage daughter with his first wife – the pair now live in Sydney – and he was hoping, as he puts it, “to have a quiet time”. The Fates, or the European Central Bank, or the Greek electorate, had other plans. Five years after a collapse in confidence over Greece’s ability to repay its debts plunged the country into a calamitous economic crisis, the weakened government of prime minister Antonis Samaras called a surprise January general election.